RIO BRAVO, Tamaulipas — For more than two years, a gas station in this border city worked as a front for the sale of fuel allegedly stolen by Mexico’s Gulf Cartel. State and federal authorities raided the business after an investigation revealed that, since June 2015, the gas station had not been buying gasoline from Mexican Petroleum (PEMEX), the entity in Mexico that controls all of the extraction, refining, and sale of fuel in the country. Information provided to Breitbart Texas by the Tamaulipas government revealed that the gas station, permit number of E1002, had not been renewing their purchasing contracts with PEMEX since 2015. The gasoline that was being sold in the business is the fuel that had been stolen by members of Mexico’s Gulf Cartel, officials stated. During the raid to shutdown the business, authorities revealed the gas pumps remained functional and they found more than 6,000 gallons of stolen fuel being sold on behalf of the cartel. 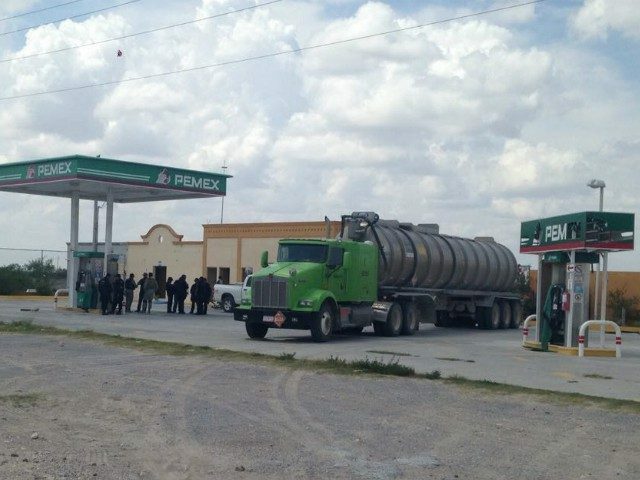 The case began when PEMEX filed a formal complaint with Mexico’s Attorney General’s Office alleging the holding and selling of illegal fuel in regards to the gas station in Rio Bravo, law enforcement information revealed. The Tamaulipas Attorney General’s Office began their own investigation on the charge of operating with illicit funds. PEMEX analyzed the seized fuel which tested positive for a gasoline sold in Mexico under the name Magna. The stolen fuel was being sold out of the gas station on the 100 block of dirt road 113 in Rio Bravo.